Hamachi is a zero-configuration virtual private network (VPN) shareware application capable of establishing direct links between computers that are behind NAT firewalls without requiring reconfiguration (in most cases); in other words, it establishes a connection over the Internet that emulates the connection that would exist if the computers were connected over a local area network. Update: a much easier way to do this is to use Haguichi, a GUI for Hamachi and Hamachi2 for Linux (includes a PPA). 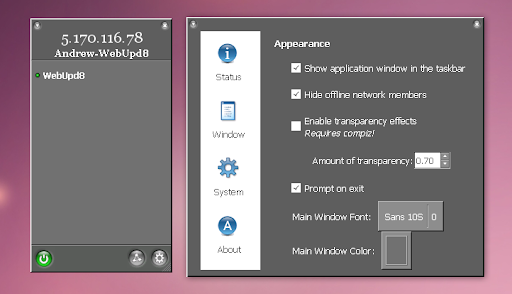 A while back we translated a script which installs Hamachi in Ubuntu and also allows you to chose between two different graphical user interfaces (GUIs) for Hamachi. The script only worked for Ubuntu Hardy, Gutsy, Intrepid, Jaunty and Karmic but today I updated it to support Ubuntu 10.04 Lucid Lynx. 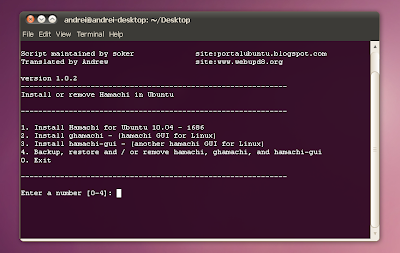 Usually you'd have to compile Hamachi yourself, download and install a GUI for it and so on but using this script, everything is done automatically. Remember! It's not recommended running a script before taking a look at the code! Once everything is done, log out and log back in or else Hamachi will not work! Credits for the initial script: PortalUbuntu (you can also download a Spanish version of the script from PortalUbuntu, but it has not been updated for the latest Ubuntu 10.04 Lucid Lynx).